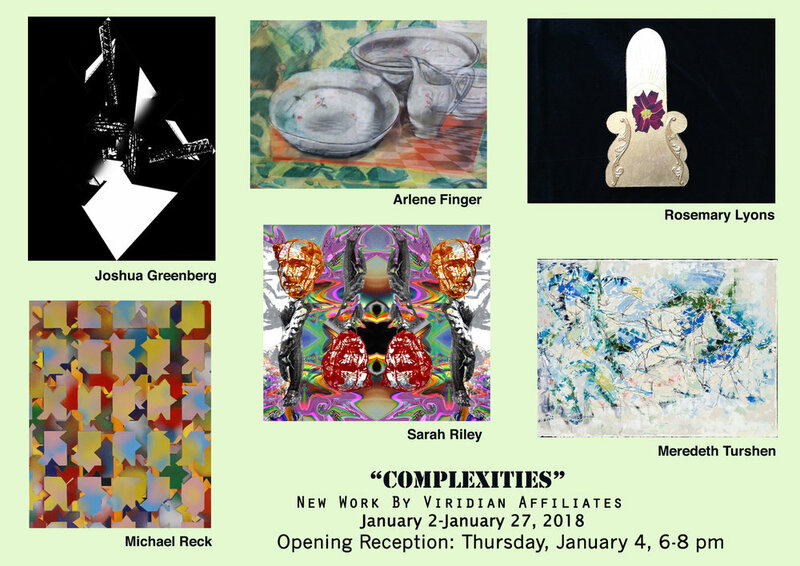 Chelsea NY: Viridian Artists is pleased to present an exhibition of outstanding art by six artists who are part of Viridian Artists’ Affiliate program. The work of each artist contains a complexity of intents and outcomes yet all approach their vision in a unique manner. JOSHUA GREENBERG uses photo-based imagery to create abstract art. In Cityscape Abstracts, he explores the use of concrete, glass and steel to make abstraction. Alleyways, buildings, and sunlight are captured and transformed into art with shadows, reflections, and variable textures providing a framework to view the busy abstraction of the city. Varying shades of gray, black and white highlight movement and frame the isolated beauty of city landscapes. For the artist, this series illustrates how photo-based imagery may help extend the use of less explored dimensions of photography to create contemporary art. ARLENE FINGER has developed her own form of representation after carefully studying light and shadow. She is interested in the color and the play of shapes, but feels free to interpret reality in her own way. Whether looking out the window or portraying objects on the table the artist’s personal vision inhabits the work. Michael Reck states "Working with stencils and spray paint has freed me from overthinking composition and allowed me to focus on experimenting with color and the variable nature of the medium. I simply continue adding layers until I arrive at the final image. Being unable to see through the stencils keeps me from knowing exactly what that image will be." Meredeth Turshen creates striking oil paintings on paper that can be interpreted as summery landscapes or read as abstract works. Inspired by Paul Cézanne, the nineteenth century Post-Impressionist painter, Turshen layers delicate oil colors on graphite drawings, giving the work character and depth. VIRIDIAN'S AFFILIATE PROGRAM is one of the many ways in which VIRIDIAN continues its mission of supporting the art of outstanding "underknown" artists.